Perhaps this is the supreme compliment that can be paid to you as a cat owner. And as a cat breeder, it is what you would want people to say to your perspective kitten buyers too. When you sell a kitten and it leaves to go to its new family, you cannot help but worry a bit about how it will be treated and cared for in its new home. To ease your concerns and to help the new owner understand and accept their new responsibilities, you may want them to read and sign The Good Cat Owner Pledge. I pledge to: Keep my cat indoors exclusively, for its own safety. I pledge to: Feed my cat a premium, high-quality cat food. I pledge to: Ensure my cat has plenty of fresh, clean water at all times. I pledge to: Scoop my cat's litter box (at least) once daily, preferably more often. I pledge to: Play with my cat every day and provide plenty of opportunities for her to exercise and be mentally stimulated. I'll spend time every day to make sure my cat knows she is special by playing, petting and talking to her. I pledge to: Groom my cat regularly so she looks her best at all times. This includes routine combing and brushing, cleaning her eyes, nose and face if necessary, trimming her nails and even giving her a periodic bath :-). I pledge to: Ensure my cat is well behaved with good manners appropriate to a member of my family. This may include teaching her to keep off food counters and tables, not clawing the furniture and not stampeding through the house at 3 in the morning. I pledge to: Never hit or strike my cat. I will work to reward good behavior rather than punish bad behavior. I pledge to: Provide my cat with a warm, dry, clean and comfortable home in which to live, sleep and play. 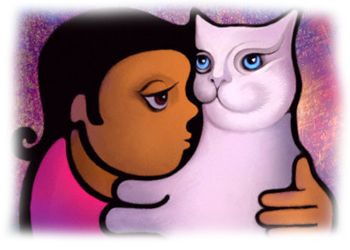 I pledge to: Keep my home “cat safe” by minimizing dangers that can be unsafe to my kitty. I pledge to: Be alert to any early signs of illness my cat may develop, including not eating, not drinking, acting lethargic, weakness, lameness, itching, any change or increase in drinking or urinating, difficulty breathing, bad breath, abnormal or foul smelling skin, obvious masses or tumors, difficulty urinating or defecating, vomiting or diarrhea. I pledge to: Take my cat without delay to my veterinarian immediately if I suspect any problem. I pledge to: Provide preventative health care for my cat including a yearly check-up, recommended vaccinations, dental care and tests for parasites. I pledge to: Ensure my cat is properly identified at all times with a collar, tag or microchip. I pledge to: Follow local laws regarding licensing. And finally... I pledge to: Treasure my cat always as a valued member of my family, and love my cat as unconditionally as she loves me.